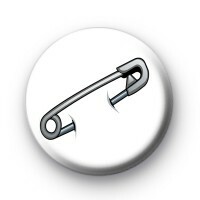 A safety pin illustration on a button badge to show that you are immigrant friendly. Following the EU referendum in the UK there has been a rise in attacks & racism against our immigrant population. A movement has started & wearing a safety pin signals to immigrants that you are a safe & friendly face in the crowd and someone who appreciates them & everything they do to contribute to our varied society. A friend to sit with on the bus or to chat with in the street. Show support for this movement by wearing a button badge with a Safety Pin illustration on it. Stamp out hate & discrimination against immigrants in the UK. Standard 25mm button badge hand made in our UK workshop. Please note that this is a button badge featuring a safety pin illustration, not an actual safety pin.